Ok. My girls are talking about this one. My 16 year old was reading it, but had to take it back to the library. It's going to be a movie sometimes, right? Yes, it's coming out soon. What did your daughter think of what she read?? I loved this book. Actually, I love everything by Gayle Forman, but this one had so much great stuff to say. About the choices we can make for ourselves. How to approach an unknown future. The meaning of courage. This was a great read! Yes, it had great insight into all of those things. Aside from this one, which other book would you recommend? I read this about 2 years ago with my eldest daughter. I don't read many YA books unless fantasy/dystopian/mystery etc because I truthfully am not interested in high school crushes and mean girlfriends anymore. I did enjoy this one as the music aspect and what happened after the tragedy was well-written. This is now a movie; I have seen commercials on tv for it already. I can understand your reticence about reading YA. For me, it has to bring something new to the table for me to wan to pick it up. I actually read it because my sister liked the book and wants to see the movie. I hope we can make our schedules align and go together! 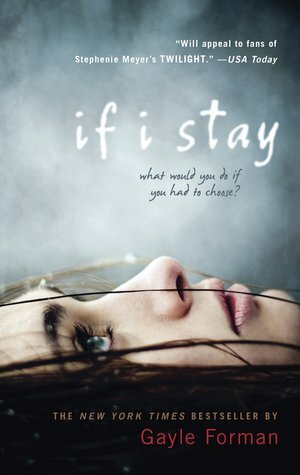 I've been hearing a lot about If I Stay, especially with the upcoming movie. I'm kind of apprehensive to read because of all I've heard... I know want to read some of Gayle Forman's work in the future, but I don't see If I Stay being a read any time soon. I enjoyed hearing your thoughts and your review has definitely pushed me to read it... Just not quite yet! That's fair! It's always interesting which things grab certain readers and which interest others. It's nice when YA fiction is more than a romance. This one sounds very interesting, but I'm not sure how I'll feel about it. What's happened to Mia is one of my worst fears (which has gotten worse now that I'm a parent!). Yes! I find myself really staying away from mysteries with child abductions, etc. just because they freak me out now. Yeah, I really liked this one, too. And I agree--it was emotional without feeling manipulative. It's such a fine line sometimes but I felt like Foreman really did a good job with that. Wow. I've seen the trailer for this, or snippets anyway, and didn't know it was so intense. I can definitely identify with a story about being close to loved ones, and you're so right that it's nice to see that she's focused on those facets as well. I love reading stories about families because I am so close to my own. Although the downside of reading a tough story like this is that you are tempted to hop in the car and go drive to see them! I'm a bit nervous about picking this up because the premise does seem emotionally manipulative, but I've only heard good things about it, so I might give it a try. I do love it when relationships other than romantic ones are well-developed too. It just seemed so whole, if that makes sense. Our communities are so diverse and varied and it's nice when books reflect that. I hope you give it a try. It's a pretty short read!